At first no one noticed the small island on the lake - nor paid any attention to the gnarly pretense of a man who drifted onto it, sitting astride a wooden log with a huge grimoire on his lap employing a shovel as his unlikely paddle. A ghastly green mist soon shrouded the island, wrapping it in a ghostly silence pierced only by a maniacal laughter and some intermittent curses. Then, one moonlit night, an impossibly crooked tower emerged high above the mist, casting a long and dark shadow on the surrounding land... The Necromancer had arrived! 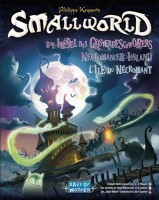 In Necromancer Island, one of the players assumes the role of a dreaded Necromancer who inhabits an island in the center of Small World's central Lake region. He captures the souls of all Race tokens lost to conquests, using them to progressively spawn Ghosts who invade the surrounding Regions. To make matters worse, his Powers grow as his reach across the land increases. If the Necromancer succeeds in bringing all of his Ghosts into play, anytime before the game's end, he wins! 1) He is an enemy to all others players, because he can end the game. 2) He has several special powers he can get during the game (persistence is brutal). 3) When a race token is conquered, it goes to the Well of Souls. 4) When 4 tokens go in the Well of Souls, the Necromancer gets a ghost. 5) When there are 14 ghosts on the board, the Necromancer wins. This makes for a challenging game, where ALL the players need to make sure they kill enough ghosts to keep the game going. In a small way…this makes the game semi-cooperative. Of course, there is always the player (traitor) who lies about what they intend to do and takes out another. This makes the game feel even more cutthroat than before… by adding a social interaction component to what used to be a relatively quiet affair. This is a very nice addition to the Small World game. It truly refreshes the concept for me and other gamers who had started to refuse to play. You have to house rule some things, as the book does not fully explain what to do in certain circumstances. I will add some of ours when I have time. Overall, a great variant. I think it’s worth the money if you’ve found the game to be getting stale. I’d wait if you are still having fun with the base game (I wouldn’t, but I’m trying to be sensitive in these harsh economic times). Nah. Get it! Necromancer Island brings a whole new gameplay to Small World. The person who choose to be the feared and legendary necromancer will find that everyone else talks about him and keeps a close eye on every move he takes because the necromancer can end the game and be crowned winner before the time is up. The necromancer has not the same goal as the other player. His one goal and pleasure is to raise his fourteen ghosts to Small World. As soon as he gets all his ghosts in play he wins. He needs four souls (killed race tokens) to raise a ghost from his Well of Souls or can buy one ghost at the price of gold wich equal the necromancer’s aktive ghosts and special powers plus one. So lets say he has three ghost and an one special power on the board then it will cost him five gold to buy one new ghost. And speaking of special powers the necromancer will in the opening of the game recive six random special powers he can use througout the game. He will start with one aktive and to get the rest he has to buy them at the same price as goes for the ghost. The Necromancer Island is a terrifying cool expansion to Small World. It gives the game a whole new vibe not only for the one playing the necromancer but also for the rest of the players. The adversaries of the necromancer will have to play together to make sure the population of ghosts is kept down to a minimum but they still have to gain more coin than the others so keep your friends close and your enemies closer because you never know when the player you just worked with to take down the necromancer’s ghosts will stab you in the back and let your scraming soul float into the necromancer’s Well of Souls. As the title says, this expansion is best with experienced players only. This is because the people who are not playing the necromancer have to walk a very delicate line between taking opponent’s territory and not killing so much that the necromancer will become strong. The very nature of Small World’s race/special power combos make it good for replayability, which is taken into consideration since the necromancer player chooses six special powers at the beginning of the game (one of which he/she starts out with and the rest can be purchases later on). Necromancer Island adds a new, interesting role inside Small World games. One player will have to use his undead army to gain even more soldiers, land, powers and gold. It can be quite difficult, and maybe frustrating, playing as the Necromancer, especially if you get a bad choice of powers to choose from at the beginning of the game, but the games can turn very interesting nonetheless. Suggested for experienced Small World players who enjoy some changes from time to time. This is an out of print component that the game company (Games od Wonder) generously allow you to download and print for free from their website. This is a great addition to the game. It allows you to shake up the way the game is played and turn it into a new game. My family enjoys games that have a main enemy that others gang up on (usally me being the punching-bag). Easy to understand rules if you already know how to play the main game. Add a Review for "Small World: Necromancer Island"
Small World: Necromancer Island expansion is free while supplies last!